Ok so I had to pre-order Mass Effect 2 today – I just can’t wait for this title to launch. Why so excited you ask? Just check out the Voice talent coming to Mass Effect 2 – I think you will have to admit this is a top notch line up (full list below video). Add in the new story line building from Mass Effect, the return and evolution of the Geth, the pre-order bonus of the Inferno Armor (shown right), you would be crazy to miss out on this game. 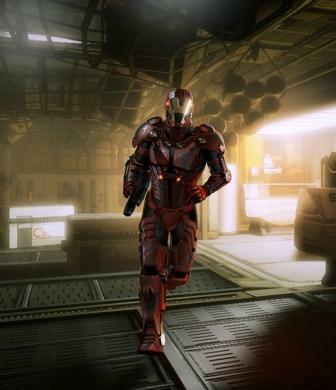 Inferno Armor is one of three bonus armors available for pre-ordered copies of Mass Effect 2. This particular armor is frequently used by officers to monitor battlefield conditions. The suit is able to recognize elevated heart rates and pupil movement in people close by. This can be utilized as a lie detector and augments the persuasive ability of the wearer, allowing for enhanced negotiation. The same array also monitors the officer and regulates sub-systems with extreme efficiency to allow for greater response times during combat and increased mobility. This augments the potency of the user’s combat, tech, and biotic abilities.